This month’s Teacher’s Corner explores the world of work and careers. 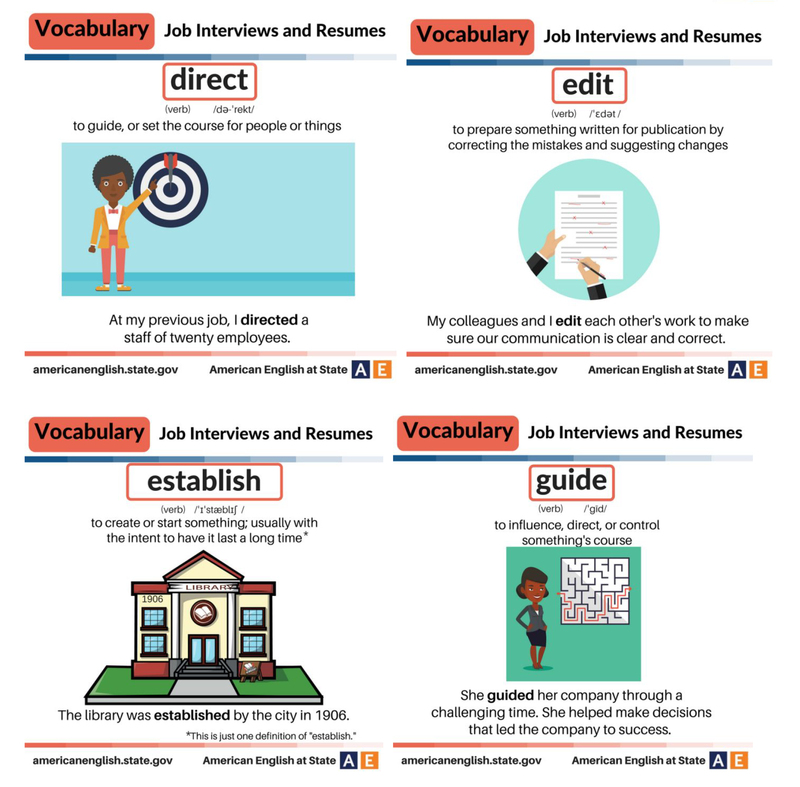 Each week covers career-related vocabulary that students can use to find a career, interview for a job, or start a business. For many English learners, the challenge of developing fluency with the use of Business English can be daunting. As we can see in idioms such as “time is money,” “the early bird gets the worm,” and “ASAP” (“as soon as possible”), the culture of American business is fast-paced and competitive. As a result, success is often determined by how confident a person is and his or her ability to share personal strengths with current or potential colleagues. 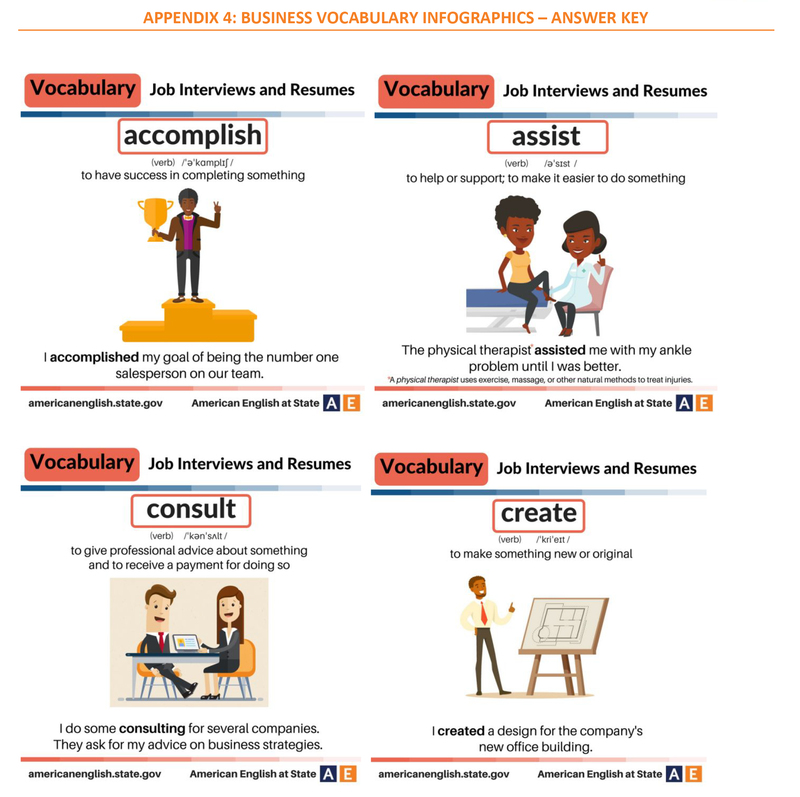 This month’s Teacher’s Corner is devoted to giving students the vocabulary they need to find success in this business culture. Week 1 begins the month with a focus on vocabulary used in the workplace. In Week 2, students learn strong adjectives they can use in a job interview. In Week 3, students have the opportunity to be creative and start their own businesses in which their classmates can invest. During the final week, students take a career quiz to discover the best job and career paths for them. 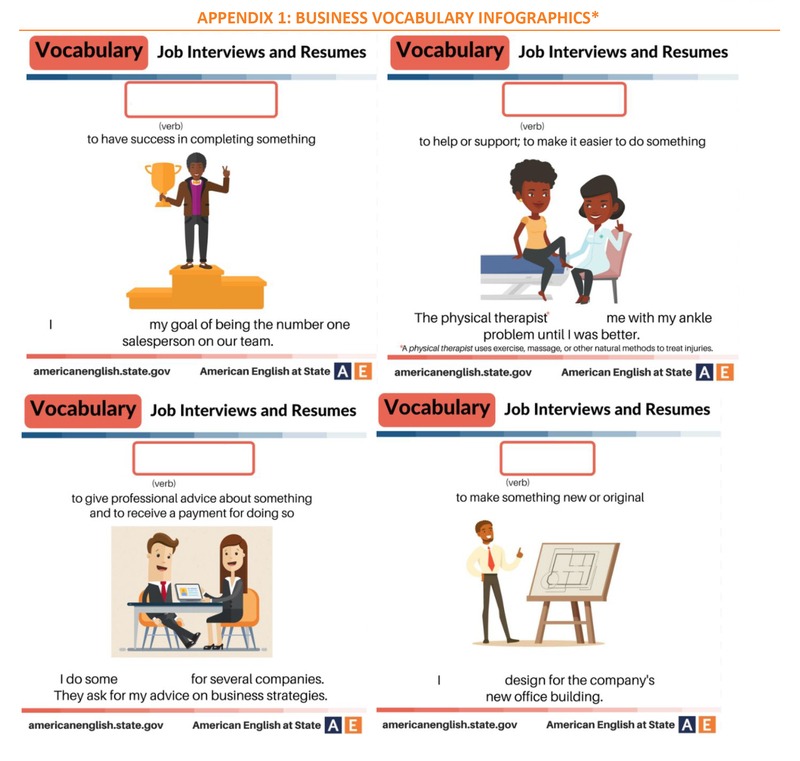 Print copies of the business vocabulary infographics in “Appendix 1: Business Infographics Blanks” and the word cards in “Appendix 2: Business Vocabulary Word Cards.” Print enough copies for each pair or small group of students to have a set. Cut out the business vocabulary cards from Appendix 1 and the word cards from Appendix 2. 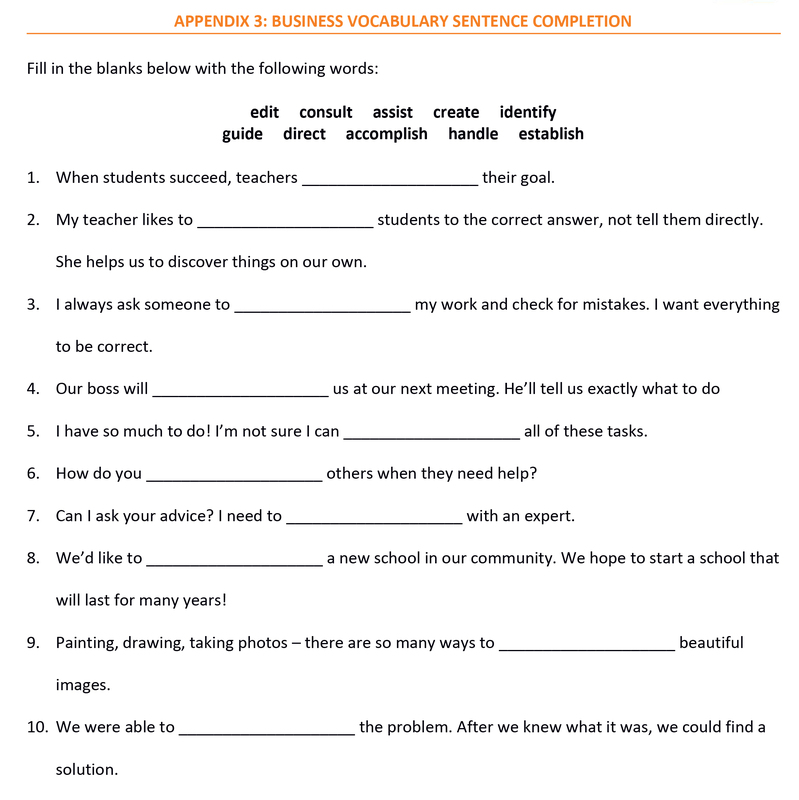 Print one copy of the activity in “Appendix 3: Business Vocabulary Sentence Completion” for each student in the class (Answers to the activities are included in Appendices 4 and 5.). Begin the class by placing the students into pairs or small groups. 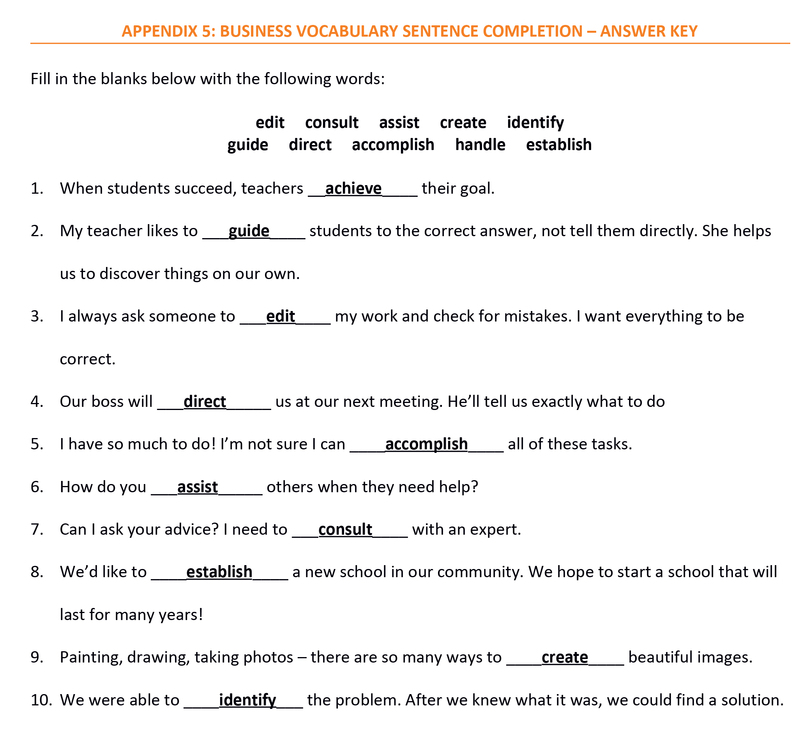 Next, give each pair or group a set of the Business Vocabulary Infographics in Appendix 1. Provide the students a few minutes to look at the cards. During this time, encourage the students to guess the words based on the pictures and definitions on the cards. 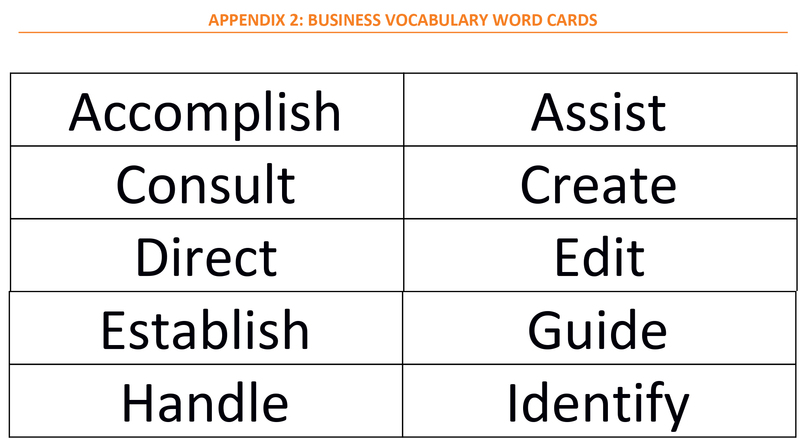 Next, provide each group with a set of the Business Vocabulary Word Cards in Appendix 2. Have the students match the vocabulary word cards to the correct vocabulary infographic. a. Note:​ Encourage the students to use the parts of speech and example sentences on the infographic cards to help them match the cards. After the students have matched the words, have the groups turn to another group and compare their answers. If the groups have different answers, have them work together as a large group to agree on an answer. Once the pairs or small groups have compared answers with one another, bring the class together as a large group and review the answers as a class. Have the students put away the cards from Part One of the activity. Next, give each student a copy of the sentence completion activity in Appendix 3. Provide students time to fill in the blanks of the activity with the correct vocabulary words. Once students have completed the activity, have them compare answers with their partner(s) from Part One of the activity. If the pairs or small groups have different answers, have them work together as a large group to agree on an answer. Once the students have compared answers in their pairs or small groups, bring the class together as a large group to review the answers as a class. a. To encourage additional reading and speaking practice, have students volunteer to read sentences aloud during the review. The beginning of any great new career starts with an interview. In the United States, the job interview is a chance for a company to see how the skills and personality of an applicant will fit their workplace. For many English learners, the American-style interview can be an unfamiliar experience because job applicants are expected to talk about themselves and their skills. This requires a vocabulary filled with strong adjectives and the linguistic competence to share plenty of details about personal qualities and experiences. 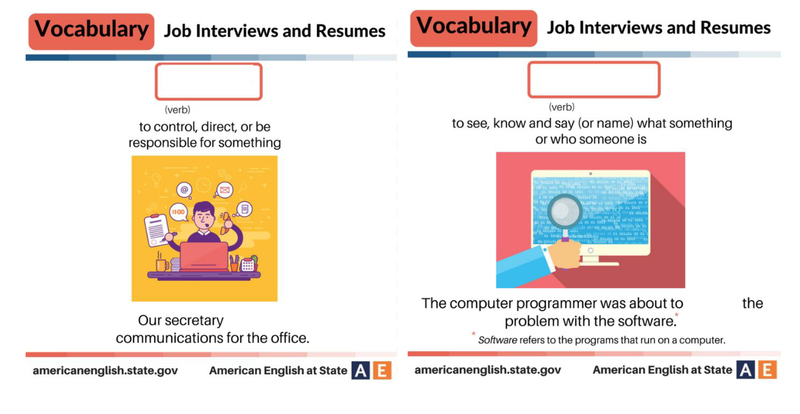 In this week’s Teacher’s Corner, students will experience job interviews while practicing strong adjectives that will make them the perfect job candidate! Print a class set of the adjectives in Appendix 1. There are 20 adjectives in the set; larger classes may need two copies, and in smaller classes, you may want to choose which adjectives to include and which to set aside. Cut out the adjectives before class. Print enough copies of the interview questions in Appendix 2 for each student in the class. Have one sheet of blank paper for each student in the class. 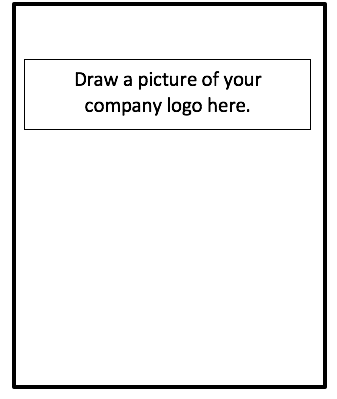 Students will use the paper to write down the name of their company. 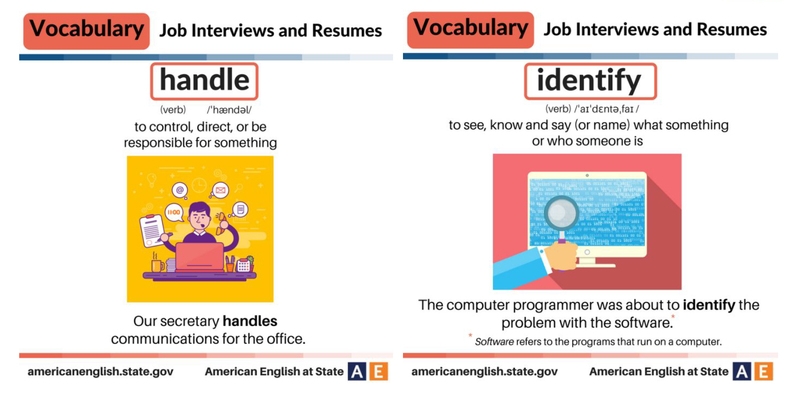 In this week’s Teacher’s Corner, students will practice using adjectives that can help them be more exact and assertive during a job interview. 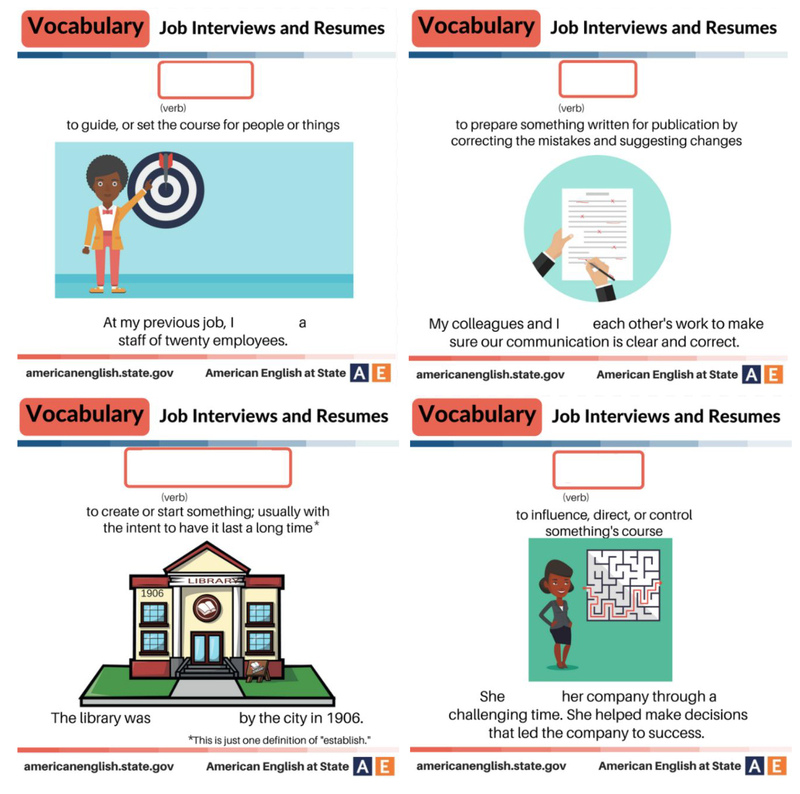 This lesson begins with a matching activity to learn vocabulary before students write and answer questions in a practice interview. Begin by dividing the class into two groups of equal number. Give half the students the strong adjective cards, and give the other half the weak adjective cards. Next, have the students mingle and look at one another’s cards. When two students think they have a match, have them stand together to form a pair. As students make correct pairs, write their strong/weak adjective combinations on the board. Writing the adjectives on the board will help students during Part Two of this activity. Once all the students have matched cards, review their answers as a class. If a pair of students is incorrectly matched, have them return to mingling until they make a correct match. Note: If students do not know all the words, that is okay. Just encourage them to make a guess based on what they know. During this warm-up, the goal is for students to think about this new vocabulary as a group. Once again, divide the class into two groups: Group A and Group B. Have each group sit on opposite sides of the room. Have the students get out a notebook and a pencil or pen. For Group A, give each student a blank sheet of paper. Have these students think of a company – this can be a real company, a sports team, or a local business they would like to represent – and tell them to write the name of the company on the sheet of paper and place it on their desks. Next, give each student in Group A a copy of the interview questions in Appendix 2. Have them read through the questions and prepare to ask interviewees the questions. What strengths and skills do I have? What education and experience do I have that make me a strong applicant? What adjectives best describe me? What kind(s) of jobs would I like to have? Once all the students have had time to prepare, have Group B stand up and move around the room to see the companies and work opportunities that Group A have made available. If a student is interested in a company, have him or her sit down with a student from Group A and have an interview. Note: If several students are interested in the same company, have them take turns. In the meantime, encourage them to sit down with another company for an interview while they wait; it is always important to get extra interview practice! Once all the students in Group B have had a chance to have an interview, have the groups switch roles and repeat the process again from Step 1. You are interviewing people for a new position at your company. Below are common questions asked during an interview. Use them to find the best candidate for the job. As the applicant answers your questions, be sure to write notes in your notebook. What information can you tell me about yourself? Why did you choose this field for your career? What are your best strengths? What would you like to improve about yourself? What is the most important thing you are looking for in a job? Do you like to work in teams, or do you prefer to work alone? This month’s Teacher’s Corner focuses on the world of work. Preparing students to enter jobs and careers can be challenging due to all the options available to them. However, any job or career path demands the ability to communicate ideas clearly and confidently. This week, students will have the opportunity to practice communicating business ideas to the rest of class by creating a start-up business. Print one copy of the business plan in Appendix 1 for each small group in the class. Students will form teams and brainstorm a product as a business opportunity. Then each group will present, or “pitch,” their idea to the rest of the class. After all the pitches are complete, students will be able to invest in the business ideas they think may be most successful! Begin by asking the class, “Would you like to start a business of your own?” As students answer either yes or no, ask them, “What kind of business would you start?” Write students’ business ideas on the whiteboard/chalkboard. Next, ask the class “What is needed to start a business?” As students answer the question, write their ideas on the board. Note: The goal of these questions is to get students brainstorming, so don’t worry if their answers are not too specific. They will have time to develop ideas later in the class. Next, ask the students, “How can you get or raise money to start a business?” Encourage students to take a minute or two before answering to brainstorm ideas for raising money with other students sitting near them. After students have had time to brainstorm, encourage them to share their answers with the class. As they answer, write their ideas on the board. After putting all the brainstorm ideas on the board, tell the class that today they are going to create a business. Have them form groups of three to four students each. Note: For this part of the activity, students can be randomly assigned to a group, they can choose their own groups, or you could have them form groups based on the type of business they would like to start. Once the students have formed groups, provide each group one copy of the business plan in Appendix 1. Allow students time to brainstorm and to answer the questions on the business plan sheet. Note: If students need more time to brainstorm ideas for a business, this step can be assigned with the homework activity described below, and students can be given several days to work on the plan outside of class. After the groups have worked on their business plan sheet, call their attention to the front of the class. Instruct the students that they will need a notebook and paper. Tell the students that they are going to watch two videos about raising money for a business. Have the students take notes as they watch the videos. Conclude the class by assigning the groups homework. For homework, have the students use their business plan to create a pitch to investors. The pitch should include the details students learned in both videos. Note: Depending on the level of your students, you may want to provide multiple days for the students to work on this assignment. Begin the class by having the students get together in their business groups. Give them a few moments to talk about their project and prepare to give their business pitch. As the groups are preparing, hand out the investment tokens in Appendix 2. 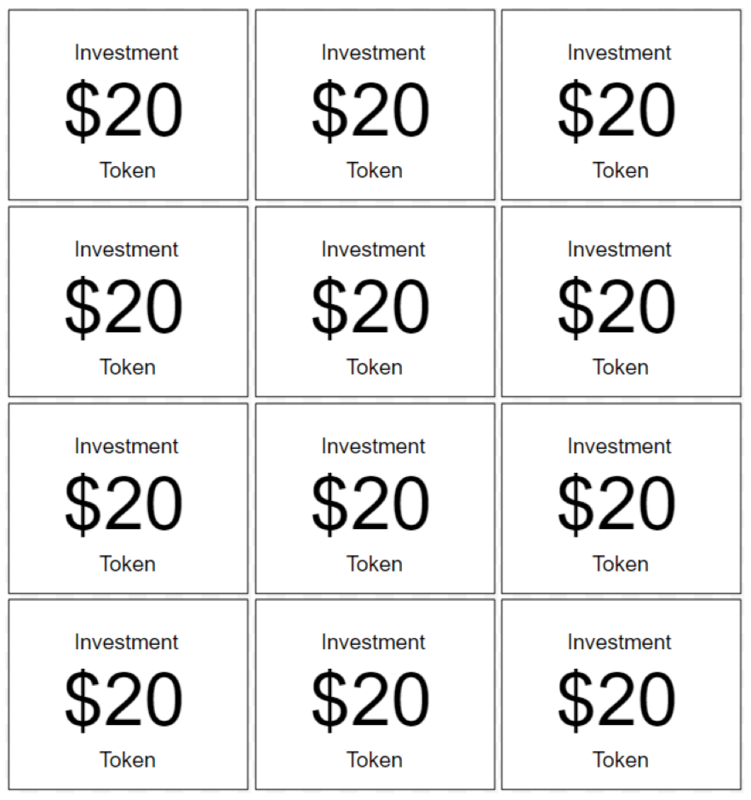 Each student should receive five investment tokens (5 tokens worth $20 each, for a total of $100). Inform the students to hold on to their investment tokens until all the business pitches are over. Next, have each group come to the front of the class and pitch their business idea to the rest of the class. Students should listen to the pitches and take notes about the pitches that interest them. After the groups have all pitched their ideas to the class, have the students take their tokens and move around the classroom. Students can use their tokens to invest in business ideas; they can invest in one or more business ideas. Inform the students that the only rule is they cannot invest in their own business idea. Once the students have spent their business tokens, have the groups sit together and count how many tokens their business idea received. Give the groups time to discuss their investment earnings. If they did well, have them think about what made their pitch successful. If the group wasn’t very successful, have them think about changes they could make to their pitch. What is the name of the business you would like to create? What product or service will your business provide? Who would be interested in buying your product or service? How do you plan to make your business grow in the future? For younger students, deciding on career opportunities can be challenging. With so many possibilities available, students may not be sure what types of jobs would be the best fit for them. Career quizzes are designed to help people decide what career paths best match their personality and working style. In a career quiz, a person answers a series of questions and then receives a list of careers that could be a good match. Using these results, a person can do more research to explore professional opportunities. In this week’s Teacher’s Corner, students will practice reading as they take a career quiz and then practice speaking as they report to the class on a career that they learned about. Prior to using this week’s activity in class, be sure to take the online career quiz. Check the quiz for vocabulary or terminology on which students may have questions. Consider your teaching context. If you have access to a computer lab, have the students take the quiz at the same time. If you have limited access to computers with Internet, consider having the students complete Part One of this activity outside of class as homework. Have the students enter the web address above into their computer’s web browser. Once students have reached the page, have them wait until the entire class is ready to take the quiz. Once everyone has navigated to the career quiz, have the students begin the quiz. As they work on the quiz, be sure to move around the room to help students with any questions they may have. Note: Each question on the quiz has two parts: a large box to the left has the first half of the question, and a smaller box to the right of the screen has the second half of the question. The first half of the question asks about interests or activities; the second half of the question asks about personal qualities. Be sure students answer both parts of each question. After students have completed the 16 questions of the quiz, they will receive a list of results. Types of careers will be ranked and listed based on the students’ answers. Have the students explore their results and encourage them to click on the careers suggested. Clicking on a career type will present the student with a list of jobs within that career path. Students can then click on a specific job and find specific information about that job. Provide students time to browse their suggested career options. Have the students write down two career choices that they found interesting. Under each of those career choices, have the students write down two or three jobs that seem most interesting to them. For homework, have the students research the career paths and jobs they selected. After they complete their research, students should select one of the jobs they researched to be the subject of a speech to the rest of the class. Note: Students can research these jobs by reading more about them on the Internet and taking notes about the specifics of each job. Where do people with this job usually work? What makes this job interesting to you? What is one interesting fact that you learned about this job? Encourage the students to write down any other information they find interesting about the job to share with the rest of the class. Explain to the students that after they have collected information about the jobs they listed, they should select the job most interesting to them and present the information they learned to the class in a short speech or presentation. Note: If a computer and projector are available, have the students create a short presentation with pictures of the job to share with the class. For this part of the activity, have the students come to the front of the class and share the information they learned about the job they selected. Note: If time permits have the students show pictures about the job they have decided to share. Encourage the other students to ask questions about the job or to share any information they may have learned about similar jobs.